I’ve used these (very) inexpensive drives for doing all things related to the desktop, including playing a lot of home HD movies (mjpeg movies). I’ll note that the movies have never been slow, and viewing them never a problem. 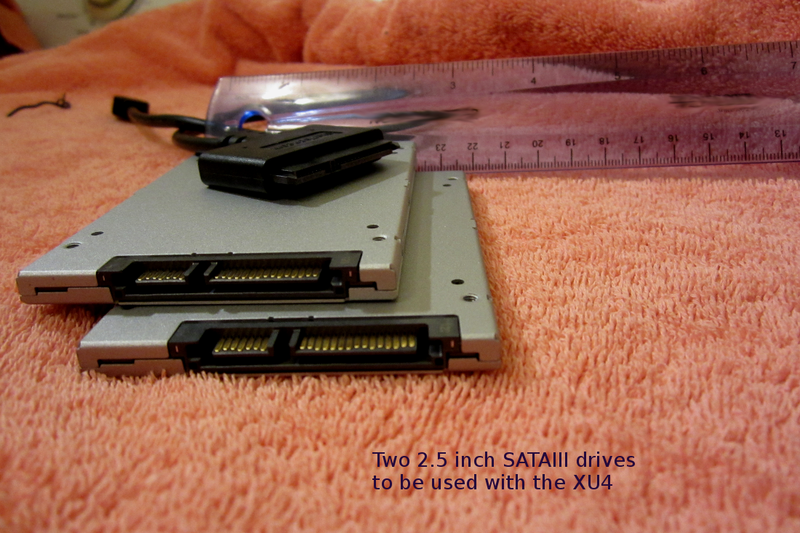 I’ve noticed some comments on other forums that imply some issue may exist with regard to using an SSD with the XU4. I can’t speak for everyone, but I’ve had no issues at all. It’s performance has been very consistent. Perhaps the issues mentioned by other posters are adapter related. So, I should mention the adapter I’m using (just a USB3/SATA3 adapter cable, with no enclosure). I’m using an adapter cable that includes the ASMedia 1051 (USB3 bridge) and the ASMedia 2115 (SATA3 bridge) chip combination. This is not a plug for that chipset, and I don’t know how long it’ll keep working, but it’s been a good performer for me so far. It (apparently) has good support in Linux, if my use thus far is any indication. I still believe the XU4 is the best SoC/SBC value on the market right now (it’s just been price reduced) – so even better. Note: The Odroid xU4 SoC/SBC board discussed here was originally purchased from Ameridroid – the american distributor for HardKernel http://www.hardkernel.com).